In this article, we guide you through the main things you need to think about if you’re looking to buy your first banjo. We also recommend our favorite picks from what’s available currently. 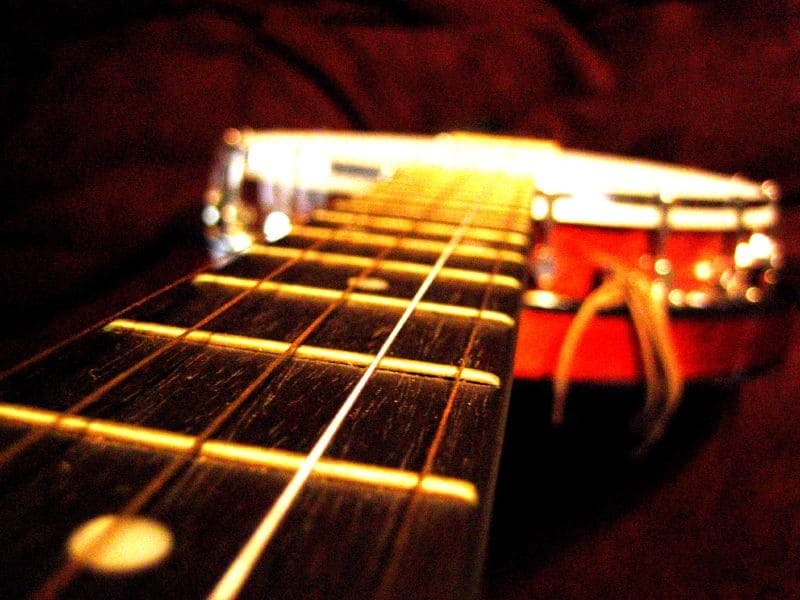 To put it simply, resonators are a metal plate which is attached to the back of the banjo. This metal sheet allows the instrument to project it’s sound towards the audience, for an overall louder performance. Resonator banjos are often preferred by Bluegrass musicians as they allow for a greater depth of sound, that can be heard when played as part of an ensemble with other instruments. Other banjos that do not have a resonator plate are often open backed. An open-backed banjo’s sound is projected into the player before being reflected forwards towards the audience. The overall tone production is more mellow and natural sounding in comparison to resonator versions. For this reason, open back banjos are most often preferred by solo performers, folk musicians or those that use a traditional ‘claw hammer’ playing style. So, you’re probably thinking, how do I know if I should buy a resonator or open-back banjo? Well, if you know that you want to play bluegrass, you’re best off buying a banjo with a resonator, just remember they can be slightly more expensive. Perhaps you’re not sure what kind of music you want to play? If so, an open-back banjo is an excellent way to start learning and are less costly, so you’ll be able to learn the fundamentals before you switch to a resonator later on. You may think that the variation in strings among banjos is just about being able to play more notes or reducing the complexity of the instrument. But this isn’t entirely true, in fact, distinct styles of music are defined by the number of strings a banjo has. Most banjos have 4 strings, but some have 5, 6 or even 12 strings and can even be fretless. The best choice for beginner players is to choose the 4-string model, which will be less confusing initially, but the 5 string is most often used by professional musicians as it makes the instrument more versatile. 5 string banjos are usually available with open backs or with resonator plates, which means they can be used to play traditional styles, bluegrass and folk music. Just remember, a banjo’s five strings are not tuned in ascending order from lowest to highest, as you find in guitars or mandolins. Rather, the top string on the neck is actually a drone string and has a shorter length than the rest. Drone strings allow you to play open chords, meaning you can sometimes play without placing any digits on the neck. Another common variety of banjo is the 4 string, plectrum model. This is essentially the same as a 5 string but with no extra G drone string. These instruments are played using a plectrum and work well with Dixieland Jazz styles of music, thanks to their tonal clarity that pierces through a mix well. The world of banjos is so diverse, there are even smaller versions called tenor banjos, that are more petite than 4 string plectrum banjos. These little instruments are widely used by folk artists, to enhance their performance, but also make great beginner instruments for petite players, as the small neck and body usually enhance playability. Crazier still, there’s even an invention called a banjolele! This a hybrid cross between the banjo and the ukulele. This thing is a similar size to the ukulele, but it looks and sounds more like a tenor banjo. Banjoleles are a great option for beginners as they are easy to handle and play. If you can already play the guitar, you might want to consider starting learning banjo with 6-strings. These instruments look and sound like a banjo, but are tuned to E-B-G-D-A-E, just like a guitar, so you’ll be able to play the same chords and scales from the get-go. That said, 6 string banjos are not actually recommended if you want to become a professional banjo player. This is because most of the techniques involved in the instrument’s mastery rely on the unusual tuning system, which isn’t included on a 6-string model. The type of wood used to craft a banjo can greatly affect the tone it produces. In particular, the material that makes up the rim, which encircles the instrument’s body, is especially important. Basically, the rim wood absorbs all the vibrations produced by the strings and distributes the sound waves out evenly through the body. High-quality banjo rims are often made from multiple layers of maple wood, to ensure the instrument produces a bright, resonant sound. On the other hand, budget versions are made from more porous wood or aluminum, which results in poorer sound quality. But saying that, most mid-range banjos incorporate woods like maple, so you should be able to afford a half decent instrument without spending tons of cash. Another important wood component of a banjo is the neck. A well-made model will usually have a mahogany or maple hardwood neck, with a truss rod inside, for adjusting the instrument’s intonation. Hardwoods make a banjo extra durable, whilst producing different tones. For example, maple is brighter in comparison to mahogany, which is warm and rich. Just be aware that cheaper versions often use several pieces of laminate that are glued together, meaning they are less sturdy and tough. In high-quality banjos, the fingerboard is usually made from an extra tough hardwood, consisting of either maple or ebony, for velvet smooth licks. Some even have carved inlays in the neck so that you can visualize the correct place to place your hand across the fretboard. Ebony can be much more expensive than maple, so just consider that before you think about buying an instrument built from this wood. The ‘pot’ is another name for the body of the instrument, so of course, its material can also affect the tone a banjo produces. The pot works in a similar way to a drum, as a sheet of material called the ‘head’ is stretched across it to amplify the overall sound. Years ago, the head was actually made from cowhide, for its ability to produce a warm, mellow tone. Nowadays, most banjo modern manufacturers make the head from mylar, which produces a brighter tone and isn’t as affected by humidity in the environment. Banjos have a floating bridge, meaning it is not actually attached to the head but is instead held in place thanks to tension in the strings. The best thing to look for in a bridge is a heavier, sturdy design as this produces an overall better sound from the instrument. With that in mind, if you’re buying your first banjo, don’t get too concerned about bridges, there’s always the option of replacing it for a higher quality version further down the line. Electric banjos aren’t as common as acoustics and are usually quieter when they’re not amped up, but of course, when amplified they can get much louder. Because they contain pickups and extra electronics, electric models are typically more expensive and require some extra understanding to set up with the amp. Therefore, most beginners go for acoustic versions. For a fairly standard mid-range price, this 5-String Banjo by Jameson Guitars features some decent design ideas. So, what exactly do you get for your money? Well, the best aspect of this model has to be its closed mahogany back and maple bridge. Jameson have used mahogany as it provides a full, resonant sound and looks really attractive, whereas maple allows the notes to sustain well and produce a nice bright tone. There’s even a removable resonator back, for that extra amplification if you’re looking to play as part of a group – This is a bit of a surprise, as resonator banjos usually cost a lot more than this instrument is selling for. Because this instrument has 5 strings, you’ll be able to learn to play a full range of traditional banjo techniques using the drone string. There’s even a geared 5th tuner, so you’ll be able to adjust the extra string to just how you like it. With that in mind, there’s also an adjustable hinged tailpiece and truss rod, so you can set up the neck and action just how you like it. Just remember, this banjo is full-sized so it may be a little big for kids. 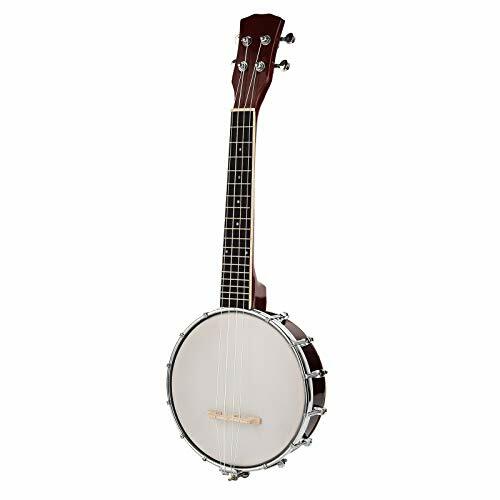 Overall, Jameson Guitar’s 5-string Banjo will suit any adult novice, looking to learn to play traditional Bluegrass or jazz styles. The overall tone this model kicks out if very nice considering the mid-range price. There’s also a lefthanded version available, for any lefties out there! Tonewood – For an affordable price you get a mahogany back and maple neck, which are high-quality hardwoods. Drone string – The 5th string can be used to play traditional styles of music. Fiddly – Removing the resonator and putting it back on may take some time. Tuners – Apart from the 5th string, which has an adjustable screw, the other tuners are quite difficult to use and not quite as precise. Lagrima’s 4 string Banjolele is a cross between a ukulele and a banjo. This thing is played and tuned like a ukulele but looks and sounds like a banjo. This model most is the most affordable item we discuss during this article, but for the price, you still get some pretty cool features. We’d say, the best thing about this instrument is its size – It’s is tiny! Which makes it perfect for kids to use and easy to carry to lessons. Lagrima’s Banjolele is only 24.5” long, with a neck that is 3.5” wide and features a press easy fretboard with low action, so kids can play notes easily, with less chance of getting that annoying string buzz. Another cool aspect here is that the instrument’s fingerboard is made from high-quality rosewood, which means it produces lovely warm, rich tones. Saying that, the closed-backed body is made from a solid piece of sapele wood, which give this banjolele deep, well-balanced, tonal clarity. As we mentioned earlier, this model has 4 strings, so it won’t be as confusing for kids to learn chords and scales on. With that in mind, they won’t have the luxury of a drone string, so will eventually miss out on learning to play using traditional techniques. So, as you’ve probably already clocked, Lagrima’s Banjolele is a perfect instrument for kiddies, as it is small, portable and specially designed for little fingers to play. For the price, you get some high-quality tonewoods here too, especially with the rosewood fingerboard. Price – This thing is the most affordable instrument we’ve reviewed, so you won’t need to break your bank account to afford one. Playability – Banjoleles are small and easy to play, making them a great choice for younger children. No 5th string – You won’t be able to learn traditional playing styles without a drone string. Tuning issues – Whilst it’s true you get some great tonewoods for the money, the bridge and tuning keys don’t keep the strings in tune for long. If you’re after a complete beginner package with your first banjo then Vangoa’s bundle is something you should definitely consider. 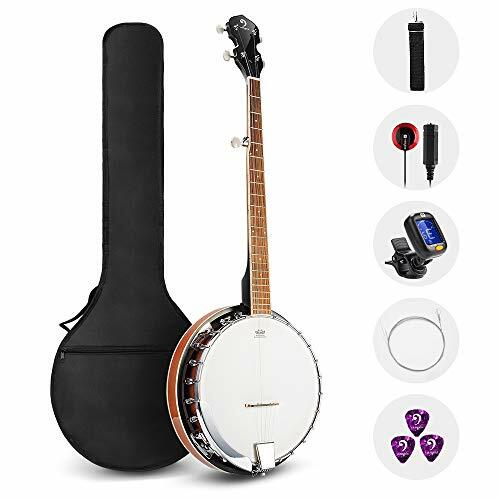 Here you get a tuner, carry bag, pick up, strings and the instrument for a similar price as Jameson Guitar’s Banjo we mentioned earlier. So, you may find yourself saving a bit of cash not having to purchase all the extra gear separately. The best thing about the instrument itself is that it features as high-quality Remo drum head, which you can bend to create different pitches in your melody, pretty cool eh? As well as this, you can actually detach the back of the banjo so it can sound like an open back instrument or a resonator version. So, tone-wise, this thing is pretty versatile and should meet the styles of both folk artists and Bluegrass players. The neck, back and sides of Vangoa’s Banjo are made from mahogany. This allows the instrument to produce a warm, rich tone whilst remaining fairly tough and durable – which is great if you’re going to be traveling a lot with it. The neck itself has an adjustable truss rod built in, which means that you can adjust the string height to your liking with little difficulty. Unlike some models, this version comes with step by step instructions which describe how to set the instrument up and how to adjust the tension safely. Overall, Vangoa’s Banjo pack is a great option for musicians that want to have the option to play different styles of music. With its additional 5th drone string and removable back, you won’t miss out on anything, and for this price, you really get a lot of quality material and equipment. Versatile – Having a removable back and an extra 5th string means you’ll be able to play most styles of traditional and modern banjo music. Price – This bundle really is value for money considering the equipment and quality tonewood provided. Not so bright – Because the tonewood used is entirely mahogany, you miss out on some of that twang and brightness that maple or ebony offer. Jack of all trades – Yes Vangoa’s Banjo is versatile, but it doesn’t offer the full intensity of a higher quality resonator model. 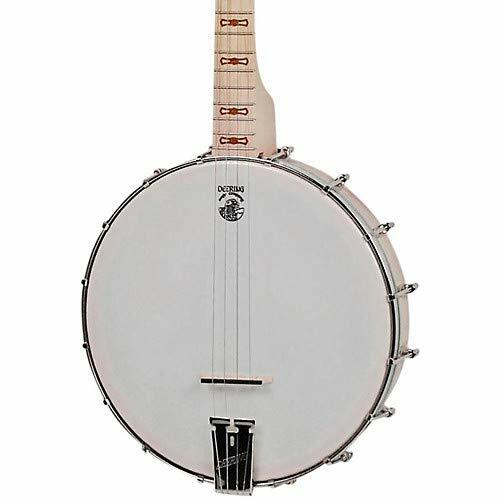 Trinity River’s TRTB1 Tenor Banjo is another mid-range product, selling for a similar price to the Jameson Guitar’s banjo and Vangoa’s bundle pack. However, this thing is 4 string resonator version and comes with a carry case, so is slightly different from the models we’ve just discussed. The two best features that the TRTB1 has to offer are its Nato resonator, which works wonders at amplifying the instrument’s sound, and the Remo head, which provides that classic bright, twangy banjo tone. So, put both these components together and you get a banjo that cut through a mix with no issues, making it a great option if you’re going to be playing in an ensemble regularly. Just be aware that there are 19 frets across the neck and that the frets are pretty wide. This longer scale size shouldn’t be a worry if you’re a larger adult, but kids and more petite builds may find this a bit of a stretch to play comfortably. With that in mind, there’s an adjustable truss rod in the neck, and a set of open tuners, so you can set the intonation and action up just the way you like it so that it’s more comfortable. 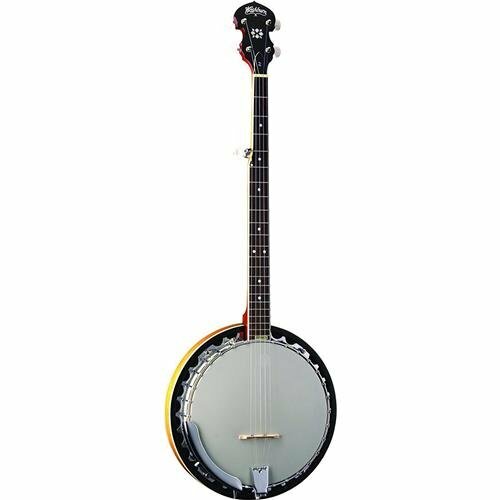 Overall, thanks to its high-quality resonator and head, this banjo is perfect for any of you looking to play as part of a group. The thing you need to remember is that the TRTB1 is going to be too large for kids and is imported from China, so with all that travelling, it’s bound to need a set up by the time it arrives at your door. Tone – The TRTB1 has a fantastic traditional banjo tone, which sounds great used in Bluegrass and Folk styles. Loud – The Nato resonator allows this thing to boom out melodies. Needs a setup – By the time it’s arrived from China, this banjo will need a setup. The case this instrument comes with isn’t protective and lacks padding. Washburn Americana’s handcrafted 5-String Banjo is the costliest model we review in this article, but you get some brilliant features for the extra cash. In fact, the manufacturers are so sure their design will stand the test of time that they’ve even included a lifetime warranty for your peace of mind. We think that the best thing about this instrument is its quality mahogany neck, back and body. This gives the instrument a lovely rich, warm tone, with plenty of resonance that booms out towards your audience. The neck is also covered in a rosewood fretboard, which further exaggerates the overall tone and volume you get from the body wood. The neck itself is fitted with an adjustable truss rod, so you can fine-tune the banjo’s intonation just how you like it. The additional 5th string will allow you to learn the full range of traditional playing techniques and comes with a geared planetary tuner, so you can change the drone tuning when necessary. The other 4 strings are manipulated by guitar style tuners, so even beginners should be able to figure out how to use them easily enough. When it comes to playability, there’s a built-in chrome armrest so that you can relax whilst you strum and marked frets, so you can keep track of where and what you’re playing. With that in mind, this instrument has a whopping 29 frets, which means it’ll most likely be far too large for kids to play comfortably and possibly some smaller adults too. Overall, Washburn America’s 5 string Banjo is perfect for adult players that want to invest in an instrument that they can play the full range of traditional music styles with. This thing is built to last, so your extra cash is probably a wise investment if you’re happy with a warm tone, rather than a twangy one. Tonewoods – Mahogany and rosewood used here give the instrument a rich, warm tone, with good amplification. 5th string – You can play traditional styles using the extra drone string. Lots of frets – 29 frets make this instrument too big for children. Price – This is the most expensive item we review, so make sure you won’t be breaking the bank if you buy one. Deering Goodtime’s Tenor Banjo is the only 6 string model we discuss today and is currently selling for a mid-range price similar to the Trinity River Banjo we reviewed above. But what exactly do you get for your dollar? Well, of course, the thing that sets this instrument apart from the rest is that a guitarist will be able to pick it up and play, thanks to it having 6 strings. So, in that way, Deering Goodtime have created a banjo that is easy to play, by incorporating a guitar’s scale and chord theory into their design. Just remember that if you’re looking to play traditional folk or bluegrass styles, this thing doesn’t include a drone string so it won’t teach you the technique. In terms of tonewood, this Banjo’s neck and body are made from sapele wood, which produces a well-balanced sound, with not too much high and not too much low twang. That said, there is also a rosewood fretboard which gives out a warm, rich tone. So, overall, this instrument kicks out warmer sounds, rather than that extra twangy banjo vibe you get from some models made from maple or ebony. In terms of playability, there are 22 frets in total, so this thing isn’t as large scale-wise compared to Washburn America’s model we mentioned above. There’s also an armrest and marked frets so you can visualize where you need to place your hand and play comfortably. Overall, due to the instrument being slightly smaller than Washburn America’s design, it’s probably going to work well with more petite musicians, that have had some experience with guitar. Just remember you won’t be able to pick up the full range of playing techniques you would on a banjo with a 5th drone string. Great for Guitarists – If you can play the guitar, you’ll be able to play this 6-string Banjo really easily. Warm tone – The Sapele wood body and rosewood fretboard mean this instrument kicks out a well-balanced warm sound. Not traditional – The 6 strings here mean this instrument plays more like a guitar than an authentic banjo. Needs a setup – This model is imported from Asia, so it will need a decent set up by the time it reaches your door. Recording King’s RKT-05 Dirt Thirties Banjo is the second most pricy instrument we review, but for the price, you get some pretty cool features. The best thing about this design is that it has 4-strings, making it easier for beginners to get their head around, without that extra drone string adding to the confusion. The instrument comes tuned to C-G-D-A, so is great for playing Celtic, folk and 30’s style Dixieland jazz. The second coolest thing here is that the neck and rim are made from maple for that bright twang, with plenty of sustain. There’s also a rosewood fretboard, for that extra smoothness and a touch of warmth – this actually works really well with the bite you get from the maple neck! It’s worth mentioning that the neck itself has an adjustable truss rod, so you can set up the intonation to meet your needs. In terms of playability, the instrument’s scale length is 23” and there are 19 frets, so most builds of musician should find it comfortable to play. As well as this, there’s also a marked fretboard, so you can visualize where to place your hands to play chords and scales. Overall, we’d say that Recording King’s RTK-05 will be great a choice for beginners, that want something simple using a high-quality instrument. Having four strings will make it easier to grasp the basics like simple chord shapes and arpeggios, however, just remember that you won’t be able to learn drone technique without the 5th string. Tone – The RTK-05 produces a bright, twangy tone, perfect for folk and jazz styles. 4- strings – This banjo won’t take as much time to master as a five string or six string model. Price – There are other 4 string banjos out there for less cost, see the Trinity River model we reviewed earlier for example. Technique – Whilst 4 strings is easier to learn, you’ll be missing out on the drone string technique, which is used in traditional banjo playing regularly. We hope you’ve enjoyed learning about different types of banjos and that now you have a better idea of what will work best for you. Remember, there’s no wrong or right option, it depends entirely on your musical journey. With that in mind, if you want to play traditional styles of folk, jazz, and bluegrass, then a five string will be your best bet. So have a look Jameson Guitar’s model if you’re a lefty or Washburn America’s and Vangoa’s 5 string banjos if you need something of high-quality. Just bear in mind, Vangoa’s version is a little cheaper than Washburn America’s design, but isn’t quite as durable. If you’re a complete beginner and want to ease yourself into learning, then go for a 4 string like Recording King’s RTK-05 or Trinity River’s TRT-B1. Without the extra drone string, you’ll pick up chords and scales more easily. If you have some experience playing the guitar already, then you’ll definitely get on with Deering Goodtime’s 6 string banjo. Just remember that with 4 and 6 strings you won’t give yourself the option to learn the full range of traditional techniques. Finally, if you need something for your kids to mess around on the Banjolele by Laguna is a great option, this thing is tiny and features a set of easy press strings and fretboard, so little fingers won’t struggle to play notes.